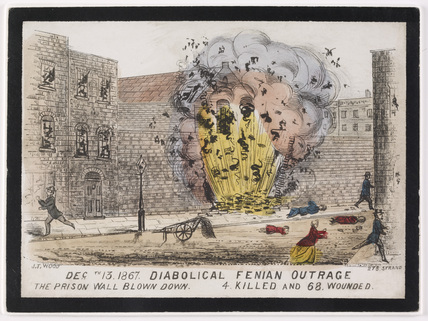 This aquatint shows the explosion at Clerkenwell Prison caused by a bomb planted by the Irish Republican Brotherhood. The bomb was an attempt by the Republicans to free seven arrested associates. The explosion ripped the prison wall and demolished a row of houses killing several residents including two children and wounding sixty eight.